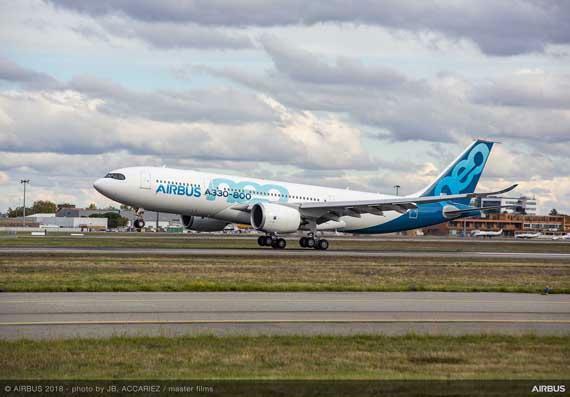 Toulouse, 6 November 2018 – The first A330-800 development aircraft to fly, MSN1888, has landed at Toulouse-Blagnac, France at 2:35pm local time after successfully completing its first flight which lasted four hours and four minutes. The aircraft, the second member of the A330neo Family, is powered by the latest technology Rolls-Royce Trent 7000 turbofans. The crew in the cockpit comprised: Experimental Test Pilots Malcolm RIDLEY and François BARRE and Test-Flight Engineer Ludovic GIRARD. Meanwhile, monitoring the aircraft systems and performance in real-time at the flight-test-engineer’s (FTE) station were Catherine SCHNEIDER and Jose CORUGEDO BERMEJO. The A330-800’s development programme will include around 300 flight-test hours, paving the way for certification in 2019. Its sibling, the larger A330-900 family member, recently completed its development testing and certification programme which validated the A330neo Family’s common engines, systems, cabin and flight & ground operations. At the end of September 2018, Airbus’ orderbook includes 13 customers who have placed orders for a total of 224 A330neos, with more to be added soon.